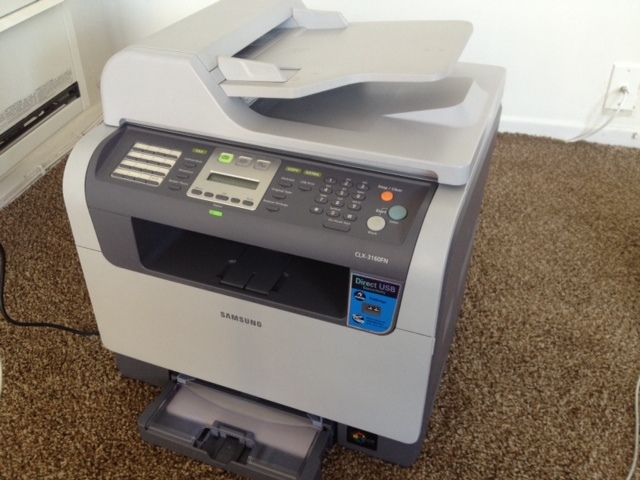 The Samsung series of laser printers has a common failure mode that is seen across many of their consumer laser printers. It manifests itself in the form of an error during the initial warm up cycle. The machine will starts humming and whirring, a clicking sounds its constantly emitted (or not at all) and then it halts and throws up an error message “Deve home sensor error”. If you search for this online you’ll see this is a widespread issue and even after at least two design revs, the problem still exists. Deve is short for developer, a part of the printer that transfers toner from the toner hopper to the main drum, which in turn transfers it to the paper. 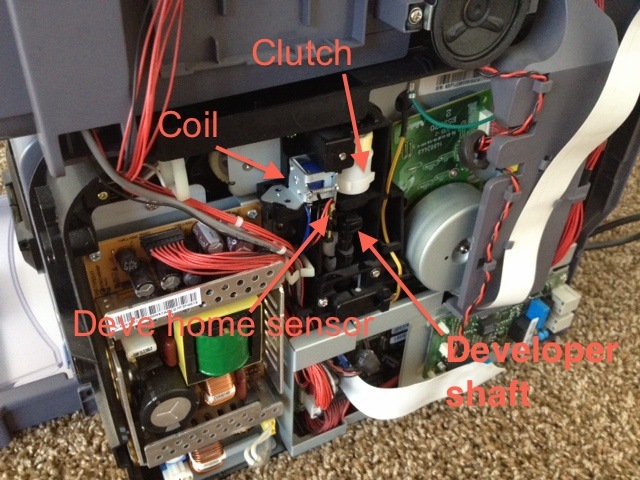 The developer home sensor is located on a vertical shaft that rotates to move the toner from the hopper onto the developer. The home sensor is an optical switch that reads flags on the developer shaft. During warm up the developer shaft needs to be “homed”, meaning it rotates until it can figure out where its current position is based on the sensor output. If it does not home properly it throws up an error code. SPECIAL NOTICE: the object on the lower left of that picture is a power supply. It has 110VAC coming in from the wall. DO NOT OPEN OR WORK ON THE PRINTER WHILE IT IS PLUGGED IN. Be careful even after it is unplugged. The capacitors in the power supply can still pack a jolt after a while. Don’t go near it with a metal screwdriver. Samsung was actually pretty clever here. Rather than have a separate motor turn the developer actuator they utilized the motion of another shaft and a clutch to start and stop the motion of the developer shaft. The errors in these machines seems to occur when the clutch is not properly engaging or disengaging. 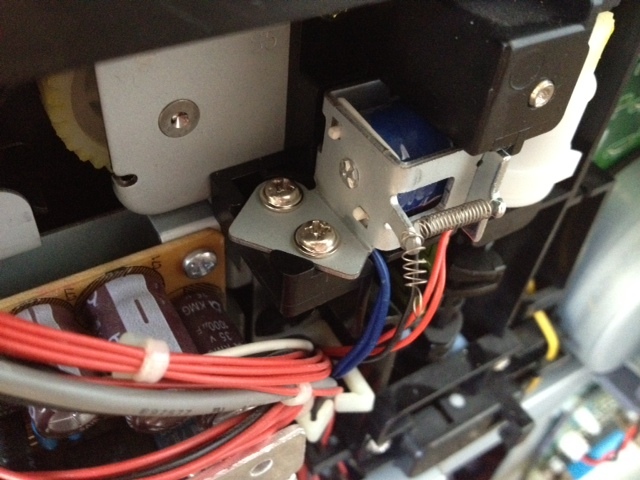 On my printer, CLX-3160fn, there is a small coil that when energized pulls a pawl (a metal tab) in to engage the clutch. When the coil is de-energized the pawl is released and stops the shaft from rotating, clutch disengaged. There are two ways this can go wrong: the coil is supposed to pull the pawl in, but can’t or the pawl is supposed to be engaging the clutch, but can’t. Either way will cause the developer shaft to move in a way the printer is not expecting, resulting in the deve home error. You can figure out which problem you are having by observing the clutch during warm up. In normal operation the clutch is supposed to move one notch then stop. You’ll here a click and then release. This will happen about 3 times spaced a second apart. When the pawl is stuck open the clutch will just turn continuously. If it is stuck closed it will not turn at all. 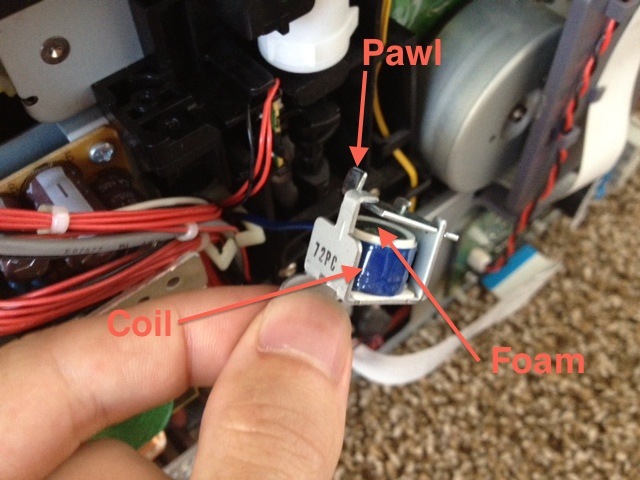 In the first case, pawl stuck open, the spring is too weak and cannot pull the pawl towards the clutch. There is some residual magnetism on the coil that the spring must overcome. To fix this you can bend the rear spring mount back a bit, or remove the spring and move the attachment location further up as shown below. More spring tension by stretching and reattaching the spring. In the second case, pawl stuck closed, the coil is too weak and cannot hold the pawl back against the force of the spring. 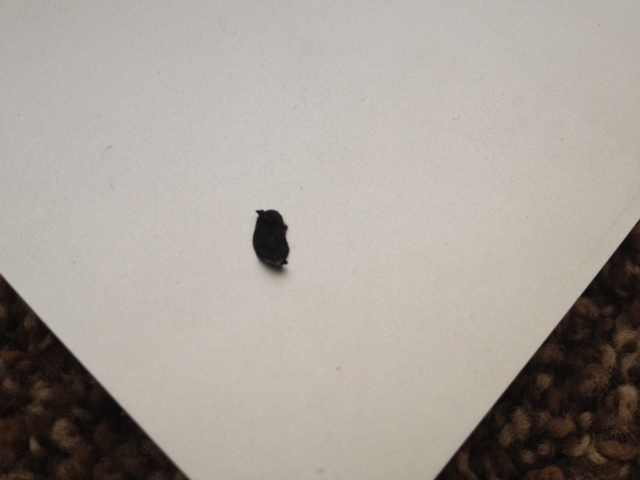 This was the issue with my printer. I did not have any success lowering the spring tension, so I had to increase the force of the coil. I took the coil off and looked at it closely. There was some foam padding in between the pawl and the coil. I suspect the foam was spacing the pawl away from the coil and thus in an area of lower magnetic strength. By removing the foam the pawl would be physically closer to the coil, where it has a higher magnetic strength. After I removed the foam and reassembled the coil, the printer warmed up with no errors and has been printing great ever since. Thanks, I wish it was so easy on a CLX3185. Great explanation and worth trying…thanks so much. Very helpful, I only had to exercise the solenoid, no adjustment needed. Thank you again. Notched up the spring about five loops and now we have liftoff. Many thanks, James! Thanks, I throw out foam and it works. Great article, thanks for sharing this, you have mentioned everything detailed and I come to able repair mine perfectly. Removing the foam dit help for me too, thanx.